Captain and Pilot (Reis barroni) must know the exact draught of the boat on which they are working. Boats coming down the river must always take the Summer Channel, or the best Channel, and meet, on the western side, boats going up. Steamers coming down and meeting another steamer or sailing boats going up and being in a strong current, must decrease her speed, but if the channel is very narrow she must, if necessary, turn round south again and go to shore. Steamers on starting from the shore must go slow. Steamers must anchor, stop or go on shore if there is a thick fog which prevents the Reis seeing the way, and the whistle must blow at intervals. Should one steamer be following another, she must, at a distance of about 1/4 mile, give two long whistles by way of warning. . . . The Manager is the responsible person on board the steamer; he has full control of every department, and he is also responsible for every description of servants on board, but must not interfere with the navigation or the working of the engine. In case of steamers going aground the Captain must work in harmony with the Reis as to the best means of getting off. Steamers to salute all Government steamers and Khedival yachts they meet or pass, with whistle three times. To salute our own steamers by dipping the Egyptian flag. In returning the salute to a competitive steamer our steamer to dip Egyptian flag three times. Saluting steamers: Under no circumstances are our steamers to salute a steamer of a competing company; but should the competing steamer salute ours first, we must return the salute out of respect for the Egyptian flag. Signal flags: Code for using them. Blue: Make to shore or drop anchor mid-stream for important communication. 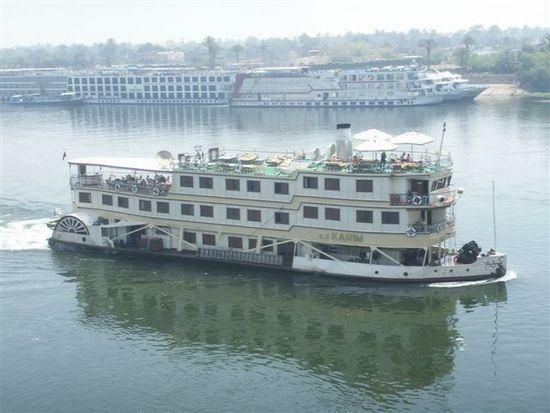 Green: Go easy or stop mid-steam, and wait for our felucca. Yellow/white/blue and green is a code for where mail has been left. Yellow and white: Can you spare provisions? If so, give one long whistle and wait for our felucca. Two long whistles means ‘No’. Under no circumstances are our steamers to stop, even if called upon to do so by the reis of any competing steamers, even if they are badly stuck and require special assistance. The only case under which our steamers can be allowed to assist would be in the event of there being any danger to the passengers on board; but under no other circumstances are our steamers to stop or render the slightest assistance to them. Mr. J. M. Cook will most likely be on the river during the season. Managers to keep a look out for him signalling any boat to stop at any point on the river, and when he comes on board, to report to him any special matter of importance that may have arisen during the voyage.